Lady Florence Caroline Mathilde Satoris was born on 5 February, 1856 at Tusmore, Oxon. Her father had been born in France and her mother was Irish by birth. She married Sir Edmund Antrobus on Tuesday 2 March, 1886, carrying a bouquet of lilies of the valley. She died on 19 February, 1923 at Eastbourne, Sussex. The newly married couple initially set up home in London, and by the 1901 census had moved with their young son Edmund, who was born on 23 December, 1886, to Amesbury Abbey, which remained their family home until 1915. During her years at the Abbey, Lady Antrobus developed an interest in its history and that of the surrounding area, including Stonehenge and Amesbury. 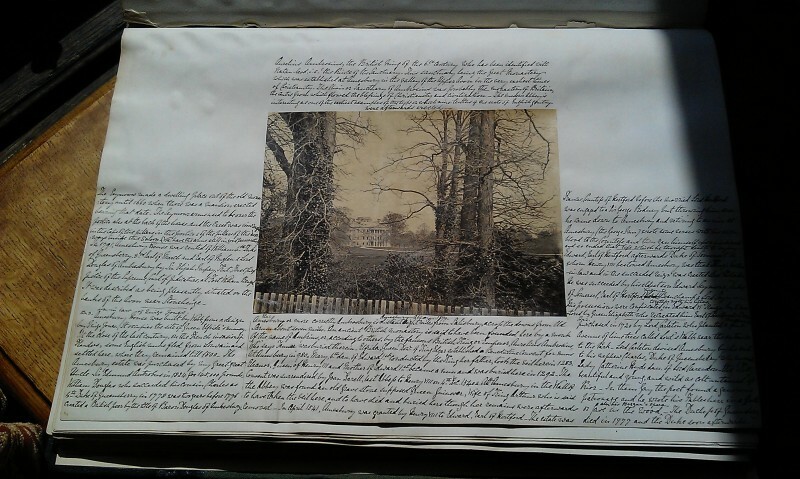 I am studying the exquisite personal scrapbook that Lady Antrobus maintained during her years at the Abbey. Reproduced below is, I hope, a faithful rendition of her carefully crafted words on one of those leaves, photographed above. “Aurelianus Ambrosius, the British king of the 6th century who had been identified with nation-lead, i.e. ‘the prince of the sanctuary’. This sanctuary being the great monastery which was established at Amesbury, in the valley of the upper Avon in the very earliest times of Christianity. The choir or sanctuary of Ambrosius was probably the monastery of Britain, the centre from which flowed the blessings of Christianity and civilisation. The modern Abbey is interesting as one of the earliest examples of the type on which nine-tenths of the seats of English gentry were afterwards erected. Amesbury, or more correctly Ambresbury, is distant eight miles from Salisbury across the Downs from Old Sarum about seven miles. An ancient British monastery is said to have been founded here by a monk of the name of Ambrius, or, according to others, by the famous British King or Emperor, Aurelius Ambrosius ‘who’ says Ta????? was buried therein. Elfrida Queen Dow of King Edgar established a Benedictine convent for nuns at Amesbury in 980. Mary 6th daughter of Edward 1st conducted by the king her father, took the veil herein 1283. Eleanor, Queen of Henry 3rd and mother of Edward 1st became a nun and was buried here in 1292. The convent was surrendered by Joan Darrell last Abbess to Henry 8th on the 4th December 1540. At Amesbury in the wall of the Abbey was found an old grave stone, supposed Queen Guinevere, Wife of King Arthur who is said to have taken the veil here, and to have died and buried here though her remains were afterwards removed. In April 1541 Amesbury was granted by Henry 8th to Edward Earl of Hertford. The estate was purchased in 1720 by Lord Carleton who planted a fine Avenue of lime trees called Lords Walk near the entrance to the park. Lord Carleton devised Amesbury by his will to his nephew Charles Duke of Queensbury who married Lady Catherine Hyde daughter of Lord Clarendon the ‘Kitty beautiful and young, and wild as a colt untamed of prior.’ In them Gay the poet found a generous patronage and he wrote his fables here in a grotto or cave in the wood, also his beggars opera. The Dutchess of Queensbury died in 1777 and the Duke soon afterwards. The Seymours made a dwelling place out of the old monastery until 1660 when there was a mansion erected bearing that date. The Seymour arms used to be over the portico also at the back of the house, and the crest was in the caps of the pillars in the portico and of the pillars of the doorways inside the saloon. (We have the arms still in good preservation.) In 1791 Amesbury House was rented to William 4th Duke of Queensbury, 3rd Earl of March and Earl of Ruglen and Lord Douglas of Amesbury by Sir Elijah Impey, first chief justice of the supreme court of judicature at Fort William Bengal. It was described as being pleasantly situated on the banks of the Avon near Stonehenge. Amesbury house was built by Webb son in law of Inigo Jones from a design by Inigo Jones. It occupies the site of Queen Elfridas nunnery. At the close of the last century on the French invasion of Flanders, some English nuns fled from Louvain and settled here where they remained until 1800. The Amesbury estate was purchased by my great great uncle Sir Edmond Antrobus in 1824 for £145 000. William Douglas, who succeeded his cousin Charles as 4th Duke of Queensbury in 1778, was two years before 1776, created a British peer by the title of Baron Douglas of Amesbury. Francis Countess of Hertford before she married Lord Hertford was engaged to a Sir George Rodney, but throwing him over, he came down to Amesbury and retiring to an inn at Amesbury (the George inn) wrote some verses with his own blood to the Countess and then ran himself upon his sword, and so ended that life which he thought death to enjoy. Lady Antrobus’s interest in Stonehenge, Amesbury and the Abbey resulted in her book being published in 1908 ‘A sentimental and practical guide to Amesbury and Stonehenge’, which can be read here. Interestingly, the beautiful verse that Sir George Rodney wrote on the last evening of his life in his own blood lamenting his unrequited love for the Countess of Hertford is included on pages 12 and 13. Lady Antrobus dedicated this book to her mother Georgina Alicia Satoris. My heartfelt thanks to the Cornelius Reid family as ever .